Dr. S. Derrick Eddy, who specializes in sports medicine, has been doing ultrasound-guided injections for more than 10 years. 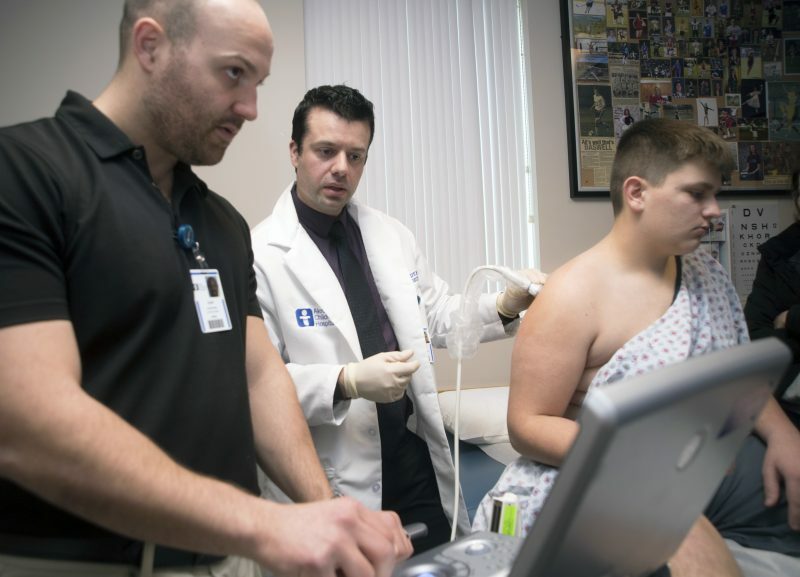 Here Dr. Zaid Khatib assists him care for a 15-year-old athlete. When you’re getting an injection for tendon or joint pain, you want to know the needle is in the right spot. That isn’t a given, because the doctor can’t see the injury inside your body. But a growing number of sports medicine doctors have turned to ultrasound imaging to guide injections. Dr. S. Derrick Eddy of the Center for Orthopedics and Sports Medicine at Akron Children’s Hospital has been doing ultrasound-guided injections for 11 years. By being able to see inside the body, he can pinpoint the pain spot in a joint or tendon sheath, and avoid hitting adjacent nerves or blood vessels. A small probe pressed against the skin allows Dr. Eddy to watch the needle on a video monitor. Here, Drs. Eddy and Khatib give John Hopp an ultrasound-guided steroid injection for shoulder pain. Despite having surgery 4 months ago for a frayed labrum and bursitis as well as months of therapy, John was still having a lot of pain in his pitching shoulder. The 15 year old plays baseball for Rootstown High School. He reported immediate pain relief after the injection. He most often uses ultrasound for steroid injections, but also for platelet-rich plasma, a treatment using platelets from a patient’s blood to repair damaged tendons, muscle, ligaments and joints. Conditions treated with ultrasound-guided injections include arthritis (Dr. Eddy sees adult patients), sports injuries, carpal tunnel syndrome, tendinitis, tendinopathy and bursitis. Ultrasound-guided injections sometimes help patients avoid surgery to relieve musculoskeletal pain, or it will control pain and inflammation until a patient can have surgery.